In a medium size bowl, combine the chicken, 1 cup onion, jalapeño peppers, chili powder, grill seasoning and garlic. Form four patties. Wash your hands after handling the raw poultry. Have a grown-up helper (GH) heat the EVOO, one turn of the pan, in a skillet over medium heat. Have your GH add the patties and cook them for 4 minutes on each side. When they’re almost done, top each patty with a mound of cheese and cook until melted. 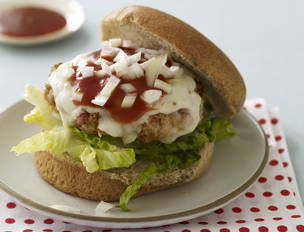 Layer each of the bun bottoms with the lettuce, a chicken patty, taco sauce, extra onion and a bun top. This is one of many “Yum-o!” recipes – it’s good and good for you. To find out more about Yum-o!, Rachael’s nonprofit organization, go to www.yum-o.org. In Recipes-list.com we have selected the most viewed recipes from category - uncategorized . Enjoy the best recipes specially selected for you! Chicken Taco Patties is the right choice that will satisfy all your claims.